Pub Fruity Fruit Machine Guide & Review - Casino Answers! Pub Fruity is a 3-reel, 1-line AWP fruit machine slot from Microgaming. 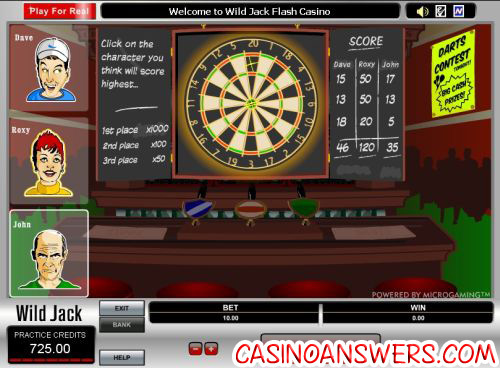 It has many special features, including nudges, free spins, multipliers, two bonus games and more. You can play Pub Fruity at All Slots Casino and Nostalgia CasinoPlay at this years #1 online casino for United States - Slots.LV. Possible bets on Pub Fruity are $0.10, $0.20, $0.25, $0.50, $1, $2, $5 and $10 per spin. Pub Fruity is a one-coin slot machine, so your coin value is also your total bet per game. To play Pub Fruity, select your bet and hit the “Spin” button. If a winning combination appears along the center payline, you will win. Payouts on Pub Fruity are: 2 cherries (2), 3 cherries (4), 3 lemons (6), 3 oranges (8), 3 grapes (10), 3 watermelons (15), 3 bars (25), 3 bells (50) and 3 Pub Fruity symbols (250). All winnings are paid out on the highest combination on the payline only. Malfunctions void all plays and pays. Pub Fruity has a Drinks Trail bonus game. Drinks Trail is what is commonly referred to as a cash ladder. If a symbol has a 1, 2 or 3 number attached, it is a Drinks Trail symbol. One or more Drinks Trail symbols will trigger the Drinks Trail bonus game. The Drinks Trail numbers will be added together and the total value will be the number of steps you move along the drinks trail. Each glass is referred to as a “Pub Stop.” The Pub Stops are: blank drink (no win; spot may be held), free spin, X2 multiplier, X4 multiplier, bonus nudge, cocktail shaker (moved to a random position), X10 multiplier, win spin (free guaranteed win spin), X25 multiplier, X100 multiplier, stoppa win (must hit “stop” on another Pub Stop) and X500 Jackpot. Pub Fruity has most of what you can expect from a British pub slot machine. Pub Fruity has got lots of special features, lots of chances to win and lots of fun. To get a 100% up to $200 signup bonus that gives you plenty of free cash to play Pub Fruity with, sign up at All Slots Casino! Can I play Pub Fruity in my web browser? 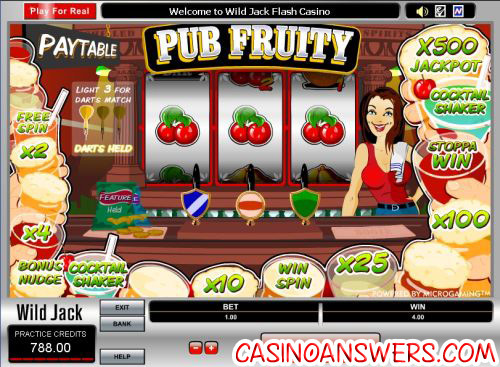 Yes, you can play a flash version of Pub Fruity at All Slots Casino. If you have any problems playing the Pub Fruity flash game in your browser, make sure you have the latest version of Adobe Flash Player installed on your computer. Can I play the Pub Fruity fruit machine on my mobile phone? Yes, you can! Pub Fruity is one of the many Microgaming games offered at Jackpot City Mobile Casino. Jackpot City Mobile offers a 150% up to $150 signup bonus. What other pub slots can I find at All Slots Casino? Microgaming casinos such as All Slots Casino have the largest selection of fruit machines you can find! If you’re specifically looking for another pub slot machine, read our Cops and Robbers Review, Deep Sea Dosh Review and our Fire ‘N’ Dice Review. Where can I play a pub fruit machine online?